GHENT, Belguim, Dec 6 2018 (IPS) - Unjustified extra charges on drinking water, exploitation of labourers in the countryside and uncontrolled property speculation. In Europe’s periphery, citizens’ initiatives show how all too prevalent modern-day ailments can be tackled successfully. More often than not with the help of artists. Pressured by the European Union, the International Monetary Fund and the European Central Bank, the government of an Ireland suffering from imposed austerity measures decides to introduce an additional levy on drinking water. Spontaneous protest ensue. A single woman, waking up in the middle of the night when workers are installing a water meter outside her house, comes out and blocks their way whilst still her night gown. She manages to get them to leave without finishing the job. Thousands follow her example in the following weeks. Some are arrested and convicted. In the southern coastal town of Cobh, citizens set up guard posts on bridges and boats to inform other citizens when the water company is arriving and where exactly it’s heading. Soon the protest receives the support of the trade unions and political parties, leading up to a demonstration march of 120,000 people in October of the same year. Mass demonstrations are subsequently held all through the country, often ending in concerts by popular Irish artists. The largest protest campaign the country had ever seen forced the government to reduce the proposed water tax by 75 percent. The water tax is currently still on the table, but the Irish now have got the “meter fairy”. Residents of a house where a new water meter has just been installed can text their address to a certain number. The same night craftsmen will come over and remove the meter. “Let me conclude with a warning,” says Brendan Ogle, one of the leading activists in the protests, “while we are progressing in some ways, we are at the same time slipping back to the darkest of ages.” Ogle refers to the housing emergency in his hometown Dublin, where rents have risen so sharply that this year the city has become most expensive place to live in the Eurozone, leaping ahead of both Paris and London. It seems to be a trend in cities all over Europe: a housing market under pressure causes speculation, leading to growing numbers of homeless people. The state doesn’t act and the law is not on the side of those who want to solve the problem. The same happened to Maria Sanchez of Cerro Liberdad, an citizen’s initiative which occupied an empty Andalusian farm owned by a bank. Sanchez put local labourers to work in decent conditions in a region that suffers from poverty and exploitation, and in March of this year she was arrested. All traces that her movement had left in the farm were erased. Ogle and Sanchez were just two of the 90 activists from all over Europe present at the summit “The Art of Organising Hope” that was held in early November in the Belgian town of Ghent. At the summit they showed each other how exactly they realised their plans to fight injustice, with the emphasis on the practical side of things. The summit was the culmination of a research all across Europe that a fellowship of volunteers, journalists, artists and activists undertook in 2016 and 2017. Thoroughly documenting 60 grassroots and civil society organisations, they looked for hopeful discourses, methods and practices to counter the present-day upsurge of Euroscepticism and indifference. In the final selection of activists to be present at the summit, the majority turned out to be from Europe’s periphery with an especially large representation from the Balkans. That was no coincidence according to initiator and organiser Dominique Willaert, artistic leader of the Ghent-based social-artistic movement Victoria Deluxe. And social media seem to be quite an effective to tool in bringing that about, it seems. At the main stage, Polish Anna Alboth and Belgian Leen Van Waes told the story of how their Facebook solidarity campaign for for Syrian civilians led to a march that mobilised more than 4000 participants from 62 countries. The Civil March For Aleppo lasted eight and a half months, passing through Europe on foot from Berlin to Syria, an action that got the organising team nominated for the Nobel Peace Prize. The most mobilising image came from the Polish artist Cecilya Malik. In the beginning of January a controversial new law removed the obligation for private landowners to apply for permission to cut down trees, pay compensation or plant new trees, or even inform the authorities of the plans to cut down trees. Up until now, more than one million trees have been reported cut down with newly cleared spaces in cities, towns and countryside as a consequence. “I knew I had to do something,” Malik says, “but I had a six-month-old baby. 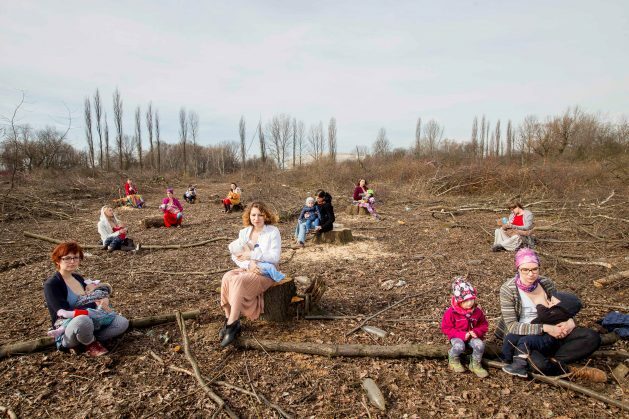 So I came up with the plan to sit on one of the stumps every day, let someone take a picture of me while I was breastfeeding and share that image on social media.” The Polish government did not reverse the law despite the hundreds of mothers following Malik’s example. But the media attention on breastfeeding mothers on tree stumps did lead to a surge in environmental consciousness with the general public. This way, a new draft law excluding the vast majority of NGOs from the consultation process on environmental projects, was shelved for the time being.